No need to own a horse to participate. Classes are offered in four ability levels: beginner, novice, intermediate, open. Any combination of ability levels on a team is permissible, but it is advantageous to have at least one rider in every class to be competitive as a team. Riders in grades 6-8 are eligible for Middle School Teams while riders in grade 9-12 compete at the High School level. The competition season starts September 15th and ends at the National Finals in late spring / early summer. Samantha Rothman earned the 2014 IEA Leading Rider Award. Zone 5 (Illinois, Indiana, Kentucky, Michigan, and Ohio) has over 150 teams although, only three in Illinois, that currently participates in this program. The USHJA Zone 5 Committee, headed by Patrick Boyle and Diane Carney, offers the USHJA Zone 5 IEA Leading Rider Award. The highest placing rider in the prestigious IEA Zone 5 Varsity Open Championship Class, who is also a member of the USHJA, will be awarded complimentary participation to either audit or ride in a 2014 George Morris clinic in the Zone 5 area. This year’s winner is 16-year-old Samantha Rothman from Temperance, MI. 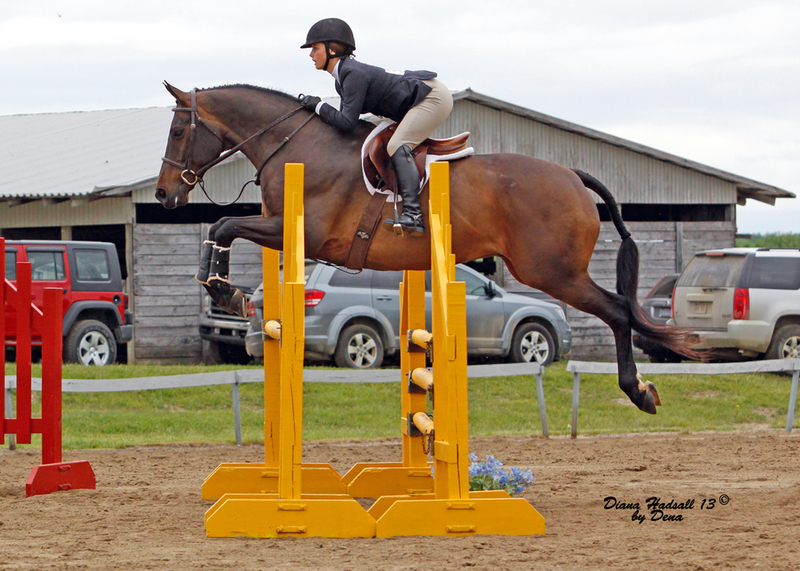 Rothman rides with the Stonehedge Farm team that her mother, Donna Rothman coaches. Samantha is excited about winning the clinic opportunity and has already started reading some of Morris's works. She intends on finishing his Hunter Seat Equitation Book prior to the clinic. Samantha has shown on the A and B circuit locally and has qualified for pony finals for the third time with her green large pony "Carolina's Cool Breeze". Samantha was also able to qualify for the first time in 2013 for the Maclay Medal Regionals held at Kentucky National. Samantha likes the IEA shows for two reasons; first, she loves to ride new horses and enjoys drawing different horses at the shows. Second, many of her teammates can’t afford to show on the regular show circuit but can afford the IEA show circuit so all of her friends at the barn get to show. Samantha attends Bedford High School and will be heading to the IEA Nationals in about two weeks in Springfield, MA. Stonehedge started their team about three years ago and now have 24 riders that participate. Rothman will be participating in the George Morris clinic at Hunter’s Run Farm in Temperence, MI, September 1st-3rd. This clinic is part of a spectacular event in conjunction with the Hunter Jumper Association of Michigan’s Finals, which Morris will judge and then teach the clinic. In addition to the Leading Rider Award, multiple scholarship opportunities are available to high school seniors through both Zone 5 and the IEA. Zone 5 offers a $10,000 college scholarship to high school seniors. Applications are due August 1, 2014. More information on how to apply can be found here. Each year at the IEA National Final competitions, the IEA awards a total of $15,000 in scholarships to the top placing and second highest placing seniors in Individual classes at our National Finals. Anna Prah was Reserve Champion at the Regional Finals and rides with the Gateway Farm Team in Libertyville, IL. The IEA also offers the National Sportsmanship Award, open to recipients of the Sportsmanship winners from each of our regular season shows. In previous years, the award winner has received $500 from the IEA and up to $1000 more in associated scholarships sponsored by the Intercollegiate Horse Show Association. The USHJA Zone 5 Jumper Committee is pleased to offer two IEA Travel Grants to help our zone teams. Grants provide the USHJA Zone 5 Jumper Committee an opportunity to give back, pay it forward and open doors for our members to be able to participate in events within which they might not otherwise be able to participate without the Zone’s financial help. 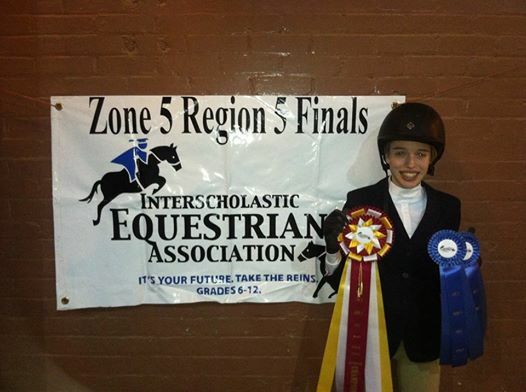 • Two $500 travel grants from Zone 5 for team travel to the IEA Zones or National Competition. In order to be considered for this grant one must meet the requirements, complete an application and submit all other required documents to USHJA no later thanMay 31, 2014. For more information or an application, click here. The IEA is a new and exciting program for both riders and trainers. The website gives details on how to start a team and lists farms that already have a team to join. For more information on IEA teams in Zone 5 visit www.rideiea.org/zone5/. This article sponsored by Winter Meadow Farm and Jeannne Lamb-Hugi.